other seldom seen residents of Powdermill Nature Reserve, the museum’s environmental research center. The images were collected in photo traps, sturdy programmable cameras with shutters triggered by motion or heat sensors. of the camouflage-patterned device contrasts with enormous contributions such cameras are currently making in wildlife conservation studies. Single cameras can collect photographic evidence of rarely seen species at a low financial cost and with minimal disturbance of the targeted creatures. Arrays of strategically placed cameras can be used to calculate population densities and chart individual territories. 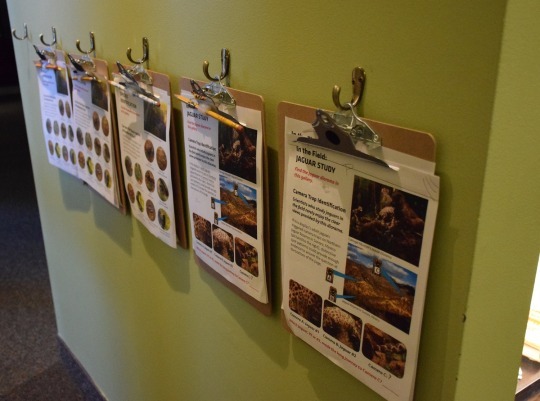 Around the corner from the display a clipboard-mounted activity sheet invites visitors to try their skill at interpreting photo trap evidence at the nearby Jaguar diorama. and Wildlife Service maintains a site of spotted cat images.